Tennessee Railroads And Railfanning In "The Volunteer State"
Tennessee railroads are perhaps best known for their rugged operations through Appalachia. 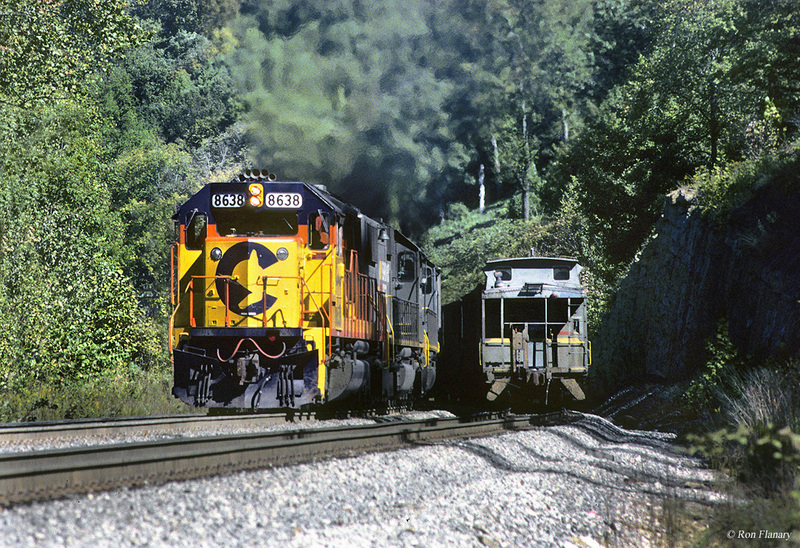 However, being so far west it is also unique in being home to both eastern and western railroads, and today Memphis is served by five Class I carriers (CSX, Norfolk Southern, Canadian National, BNSF Railway, and Union Pacific), one of only five cities in the country able to claim such a lofty distinction. In total, Tennessee is home to six of the seven North American Class I railroads as Kansas City Southern Railway also derives a small amount of its traffic from the state. Rail lines in the Volunteer State run both east-west and north-south so the operations are quite diverse. And, throw in eighteen short line railroads and you have plenty of action to see! Additionally, Tennessee also has a fascinating history with trains as most of the south's most well known railroads operated in the state including a number of Midwestern companies (which, as aforementioned, were seeking to reach Memphis). 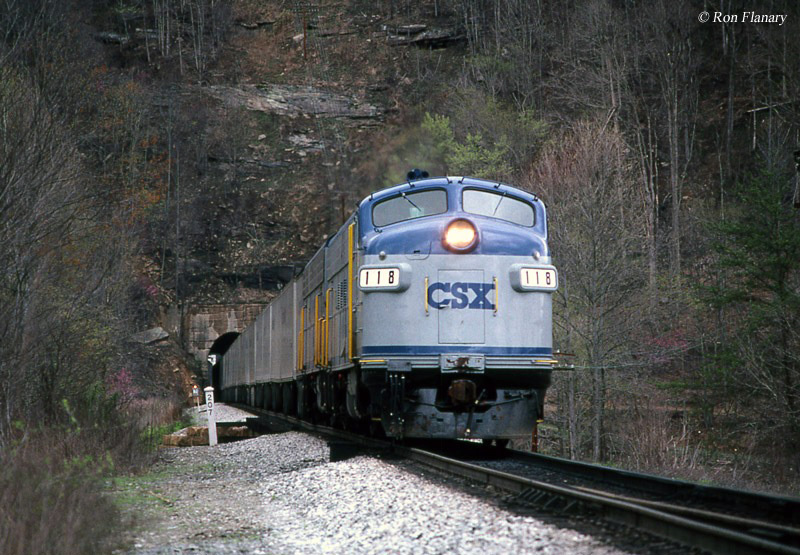 Tennessee railroads date back to 1845 when the Nashville & Chattanooga Railroad was chartered to connect its namesake cities, and it completed its main line on February 11th, 1854. The railroad was chartered, however, nearly ten years earlier in December 1845 but due to rugged terrain that required several tunnels and bridges the 125-mile line took years to complete. 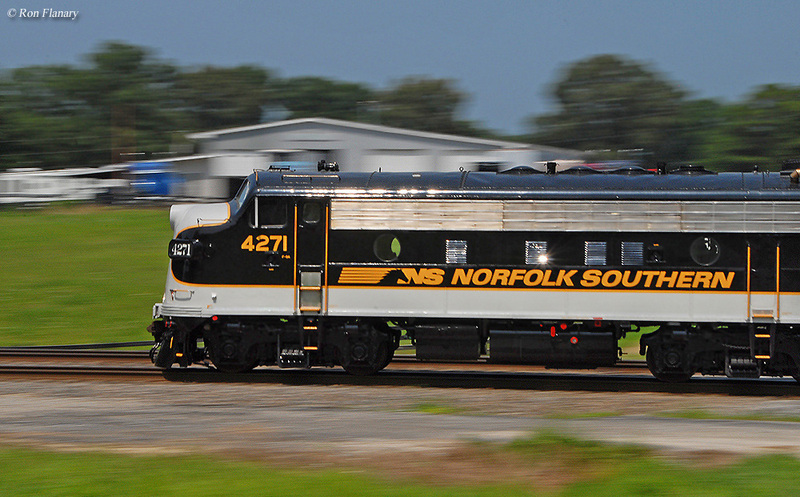 During the Civil War the N&C found itself constantly under attack from both Northern and Southern forces resulting in the company having trouble seeing any substantial growth. In 1872 the railroad was renamed as the Nashville, Chattanooga & St. Louis Railway as it continued to expand following the war, intending to reach St. Louis to the west. Unfortunately, the railroad lost its independence in 1880 when after a nasty stock battle the Louisville & Nashville took control of the company although it was not dissolved as an operating entity until 1957. In the succeeding years following the construction of the Nashville & Chattanooga, Tennessee would be home to most of the South's largest railroads with Memphis a hub for several more railroads, both east and west. Today Tennessee railroads are mostly the domain of CSX and Norfolk Southern (with a few miles also operated by KCS reaching Counce, Tennessee) along with the hub of Memphis which sees interchange traffic among UP, BNSF and Canadian National along with the aforementioned railroads. 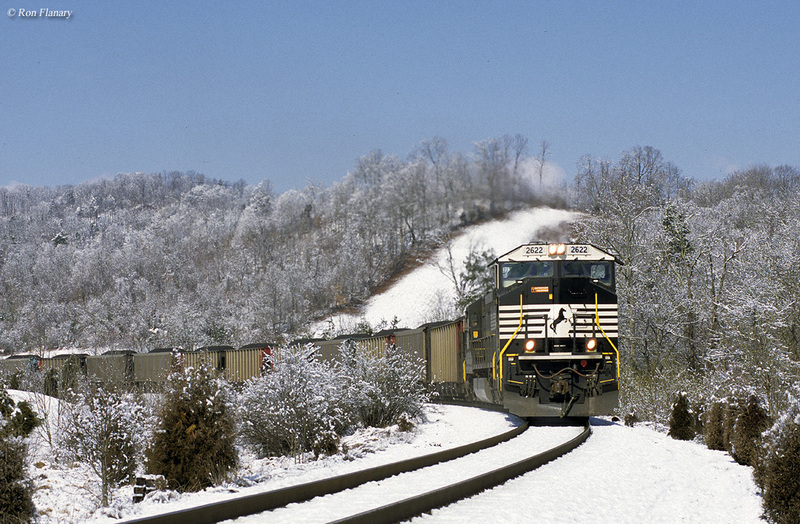 Aside from the Class I systems, Tennessee also features several short lines some of which include the Caney Fork & Western Railroad, Conecuh Valley Railroad, East Tennessee Railway, Knoxville & Holston River Railroad, KWT Railway, Nashville & Eastern Railroad, Nashville & Western Railroad, Sequatchie Valley Railroad, Tennken Railroad, Tennessee Southern Railroad, Walking Horse & Eastern Railroad, West Tennessee Railroad and the Wiregrass Central Railroad. In total, today these railroads operate about 2,600 miles of the original 4,100 miles of track originally located in Tennessee. With the state retaining nearly 64% of its original rail infrastructure, this is a remarkably high number considering that so many states have experienced losses typically over 45% of their rail networks. 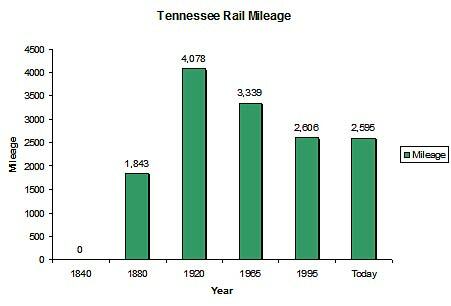 For a more in-depth look at the state's route mileage over the years please refer to the chart below. As for passenger trains Amtrak still operates Illinois Central's City of New Orleans, which calls at Memphis. And, the Volunteer State got its first commuter rail service in 2006 when the Music City Star which operates between Nashville and Lebanon to the east, a distance of just over 32 miles. 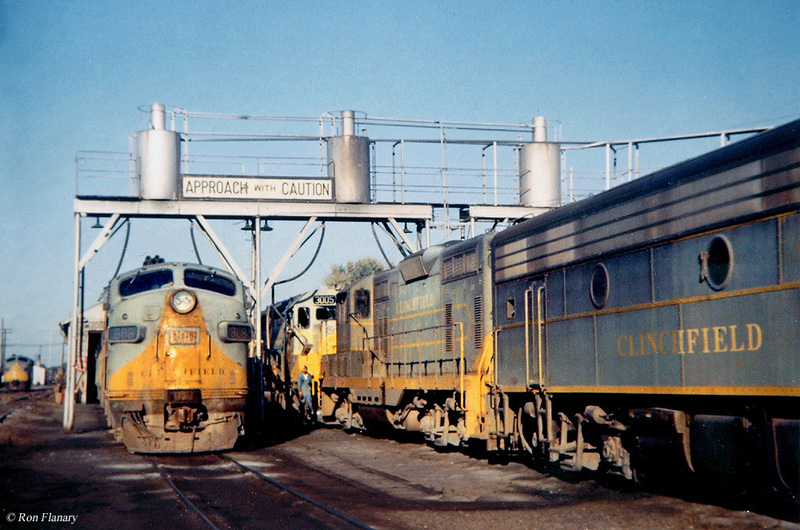 To learn a little more about some of the classic streamliners which served Tennessee please click here to visit the site's section covering the subject. Tennessee railroads feature several museums and tourist railroads like the Three Rivers Rambler and Tennessee Central Railway Museum. The Three Rivers Rambler offers numerous train rides behind motive power like a Baldwin 2-8-0 and an EMD SW600 (one of only a handful ever built). The Tennessee Central Railway Museum likewise features excursions but also tells the history of one of Tennessee's most famous railroads. Of course, there are several more museums and tourist trains in Tennessee than those listed above. In all, along with its rich history (such as Casey Jones, who is buried in Jackson, TN and whose home is now a museum) Tennessee railroads offer a wide range of operations that should appeal to about any railfan. If, however, you are just interested in museums and/or excursion trains the Volunteer State offers plenty of those as well! And lastly, after a thorough day of enjoying everything Tennessee has to offer book a room in the Chattanooga Choo Choo, the Southern Railway's former Terminal Station.